In my diverse excursions into miniature wargaming I have created and painted various miniatures and pieces of terrain. I play Necrons. That is to say, I have Necrons. I’ve played just a couple of times but, for some reason, buying and painting my Necron army is more fun that playing them. I like variety but the Necrons are known for their uniformity so I created a back-story to allow for more creative freedom. 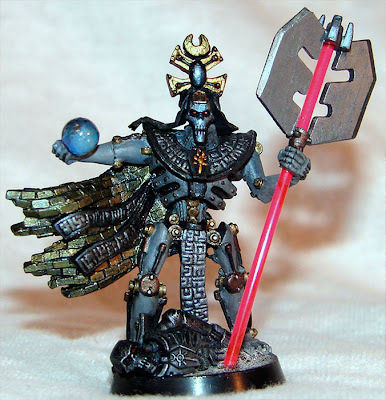 My main Necron Lord is called the Collector and he gathers the survivors from lost battles to his army. This allows the mishmash I was after. Here is one from each of my three squads of warriors which chow their color diversity. I never was a fan of the Green rods for their Gauss guns so I replaced then with blue, yellow, and red ones. The Immortals are nice, but they look too much like warriors so I created my own using an over the shoulder look using the old immortal blasters. Their gold is a little more striking that I would like, but I wanted to continue using different colors. I do love the Monolith. 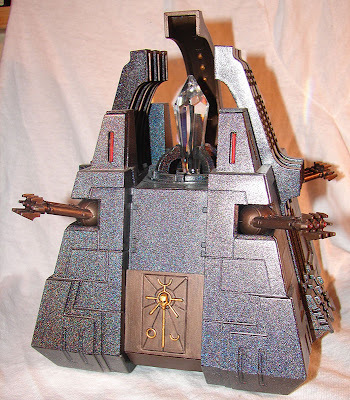 I painted mine with color shifting paint which looks great in daylight but not so much indoors. I stole the idea from here. I also added a white LED below the center crystal. And, of course, I needed the Collector. 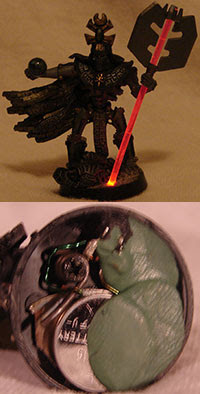 I’ve always liked the older Necron Lord best but I had to do something extra so I added a light. I replaced the Staff of Light with the same red rods I used for the warriors. I placed a small red LED in the base and allowed it to shine up through the new staff. It has a pretty cool effect. The resurrection orb is actually an Ice Breakers liquid breath mint. It looks cool, but if it breaks my mini will be minty fresh. Like more 40k players I have only half my army painted and maybe one day I’ll finish them all.